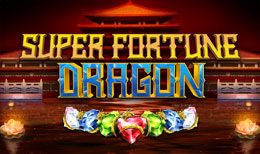 Super Fortune Dragon by Blueprint Gaming is a 5 reel and 10 payline slot with a Chinese theme. The game looks pretty standard, but promises a lot of decent sized wins for players. If you’re into oriental themed slots and big payouts, then you’ll love this game’s features. The stacked white diamonds will reward punters up to 250x your stake. The game’s Action Spins feature can win you over 4x your stake and you get to play on 4 different reel sets- each with a special dragon icon that transforms to match with another symbol to provide better winning combinations. Stakes start from between 20p to £100 per spin. Blueprint Gaming is a UK based company that’s been developing land based and online slots for a while now. In 2008, the UK Company was bought up by Gauselmann group, a large German gambling corporation. Not only does Blueprint Gaming create unique games of their own, they also create licensed games from TV and movie franchises. Some of their creations include ‘Casper’ the ghost, the ‘Worms’ computer game and more. Some Blueprint slots have innovative bonus games and special features, while others are simple and follow a more traditional approach. One thing the games have in common is smooth game-play and high quality production. Blueprint slots are accessible on mobile and desktop. Super Fortune Dragon has got a simple design. The action takes place in a traditional Chinese palace which is the reels’ backdrop. Game symbols include card values 10, J, Q, K and A. the K and A reward the highest value of 200 coins per line. Next up are the green and blue gemstones which reward 300 coins and the red ruby which rewards 400 coins. The highest paying symbol is the shiny white diamond which gets you 100 when you land 3 matching symbols, 300 for 4 matching symbols and 500 coins for 5 matching symbols. These symbols can land as a stacked formation too so if luck is on your side, you’ll find yourself with all 5 reels filled with stacked white diamonds. This can win you 250x your stake or a 5,000-coin bonus. Action Spins feature- Any win formed equal to 4x your total stake or higher, will give you the chance to activate the action spins feature. You can choose to do so or not. If you do, you’ll get to play on 4 different reels sets which give players 4 different chances to win bigger prizes. Bonus symbol- Whenever the special dragon symbol lands on the reels, all of them transform into the same matching symbol and end up creating some potentially amazing clusters. The only thing in this game that makes it worthwhile is the Action Spins. Other than that, it’s a pretty plain slot. Luckily the feature occurs regularly and helps in making things a little more exciting. It would be great if we could see a little more spice here e.g. a free spin round. There are hundreds of Chinese-themed slots out there and it’s nice to see Blueprint Gaming attempting to stand out with the Action Spins addition to Super Fortune Dragons.